So you’re looking to hire a concrete contractor, and you know you need to do your research. That much is obvious – you don’t want to throw away money when you could be saving it, and you don’t want to cut on quality. But how do you choose when there seems to be no regulation or official rating system? Today we’ve put together a checklist of things you can look for to help you choose the right concrete contractor. If you’re wondering how to choose the right concrete contractor, step one is to stop wondering! You should take the steps to confirm you’re looking for the right contractor. A good sign to look for is that the contractor has published a portfolio or a gallery of their past work on their website. You can use the visual information to assess the type of projects they conduct. – Do they concrete home driveways or larger-scale projects? – Does their work look like something you’d like? – Do these things work for you? Many concrete contractors can do both small-scale and large-scale work. In this case, it’s worth having a look at the clients they’ve had in the past. If there’s a brand name you recognise and like, then great! If not, you can always physically visit the site to see how the concrete looks. Don’t be turned off by this time-consuming task. It’s far better to ensure you approve the work before signing a contract. While visiting the sites of past work can physically help your judgment, checking for online reviews is extremely valuable as well. You can look at the contractor’s website for customer testimonials, however, unless stated otherwise, you should note these testimonials may be a marketing ploy. 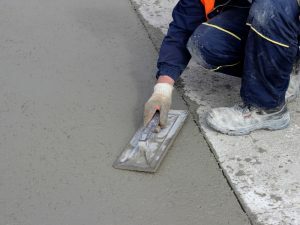 Reviews are helpful when trying to choose the right concrete contractor because they discuss the service as well as the final product. Take notes on how customers speak about the contractor and decide whether that sounds like someone you’d work with. Concreting is a trade that virtually anyone is qualified for. How is that, you ask? Because in Australia, there are no formal qualifications required for concreting. This can explain the array of horror stories arising from the issue that totally inexperienced workers can conduct any job. Therefore, when you’re tossing up between a few contractors, it’s definitely worth looking at their years of experience in the industry. Price can also be a key indicator of quality. You should be comparing a few contractors’ quotes on the same materials for the same job. Massive gaps in price are red flags of low-quality products. It sounds simple, but a sign of a professional contractor is the pride they take in conducting themselves. If they are polite, open and honest about the process, that’s a great sign that they won’t manipulate you into accepting a bad-quality job. It’s extremely important to ensure that the contractor is insured in case any accidents occur on your property. Insurance is not just a smart way to filter contractors – it protects you from forking out thousands for something that you shouldn’t have to pay for. Another great sign is a product guarantee or warranty. If the contractor is confident enough in their service to offer a guarantee, this shows that they are confident that you will be satisfied. It means they’ve considered their customers, not just themselves. Looking for the right concrete contractor? Although these have been our larger clients in the past, we also specialise in doing concrete driveways in Melbourne. We have serviced over 1000 regular families! Give us a call today on (03) 9308 6112 whether you’re looking for a consultation or general information.